For some people, riding a motorcycle symbolizes freedom and an insatiable thirst for adventure. Unfortunately, the reality is that riding a motorcycle can be just as dangerous as it is exhilarating. According to the National Highway Traffic Safety Administration (NHTSA), approximately 92,000 motorcyclists were injured—and 4,586 were killed—in motor vehicle traffic accidents in 2014 alone. Additional NHTSA statistics show that motorcyclists are six times as likely to be injured—and 27 times as likely to die—in motor vehicle crashes than passenger vehicle occupants. Just what makes motorcyclists so vulnerable to accidents and injuries, and what, if anything, can be done about it? Read on to learn more. Motorists are not used to watching for vehicles with smaller profiles. Motorcyclists and motorists alike are expected to share the road safely. However, this expectation does not always translate to reality. While motorists are accustomed to watching for other passenger vehicles and large trucks, they sometimes fail to see or watch for vehicles with smaller profiles, such as motorcycles or bicycles. Motorcyclists are more at risk for accidents caused by poor road maintenance and inclement weather. Hitting a pothole, running over debris in in the road, or the sudden onset of bad weather—such as heavy crosswinds, snow, or sleet—may not be dire for motorists in passenger vehicles, but can be extremely dangerous for motorcycles. 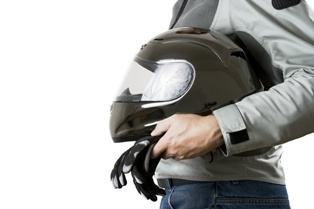 The consequences of an accident tend to be more serious for motorcyclists. When a motorcycle and passenger vehicle collide, the occupants of the passenger vehicle are protected by a strong steel “cage” and airbags, while there is very little standing between the motorcyclist and the road. As a result, motorcyclists often sustain serious—or even catastrophic—injuries in motor vehicle accidents. Motorcyclists can face unfair biases and prejudices. Stereotypes of motorcyclists as reckless outlaws can complicate accident victims' efforts to seek compensation for their injuries—even though studies show that motorists are often at fault in collisions between motorcycles and passenger vehicles. Stay alert. Avoid riding while drowsy, under the influence of alcohol, or under the influence of sedating over-the-counter, prescription, or recreational drugs. Never leave home without a helmet. According to the Insurance Institute for Highway Safety (IIHS), motorcycle helmets are approximately 67 percent effective in preventing serious head injuries and approximately 37 percent effective in preventing motorcycle deaths. Choose a motorcycle helmet that meets U.S. Department of Transportation (DOT) Federal Motor Vehicle Safety Standard (FMVSS) 218 and bears the DOT symbol on the back. Helmets with plastic shields also protect the face from wind, dust, rain, insects, pebbles, and other debris. Wear proper safety gear from head to toe. Whether it is a quick jaunt across town or a road trip across the country, motorcyclists need as must protection as they can get. Opt for leather or heavy denim pants and a jacket to completely cover the legs and arms, boots that cover the ankle, and riding gloves that allow for a firm grip. Utilize bright clothing or reflective tape to improve visibility. Follow all traffic laws and don't take unnecessary risks. Don't reinforce stereotypes about motorcyclists; obey traffic lights and signage, avoid speeding, and ride defensively. If you were seriously hurt in a motorcycle accident caused by someone else's negligence, you may be eligible to file a personal injury lawsuit to seek compensation for your injuries and other losses. However, biases against motorcyclists can make pursuing damages a challenge. The experienced attorneys with the Morris James Personal Injury Group can help motorcycle accident victims fight for the fair financial recovery they deserve. Contact the Morris James Personal Injury Group today to schedule a free, no-obligation initial consultation to discuss your motorcycle accident case.